There are many reasons why many international companies are listed in the US market. Some of the facts are as follows: liquidity, diversified investors, trade in US Currency, Better regulatory environment and US Market Awareness. Also many international companies choose NYSE because of the more confidence, human judgement,more visibility, prestigious network and unparalleled service. Canada has 129 listings, Latin America 114 listings, Europe 155 listings, Africa 7 listings and Asia/Pacific 120 listings. 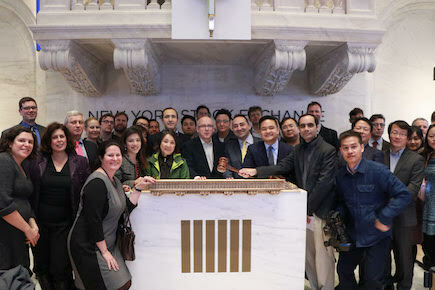 “We are an unique and maybe the last stock exchange to have a trade floor. There is a human judgement and accountability here .You want to have a pilot with accountability and judgement. Our market model is superior. We are in incredibly convenient place. We had over 100 head of governments coming to NYSE past 10 years.We are a home to the greatest companies on earth.We are the first exchange permitted by the Chinese Securities Regulatory Commission, has a representative office in China.We are also part of the intercontinental exchange founded 20 yrs ago.”” John Tuttle added. Here is the view from the John Tuttle who has a positive expectation from Trump Administration: "After election results, Investors and market participants had realized was that the campaign rhetoric is over we have seen results.What we have been able to concluded is there is real meaningful chance that we may have a corporate tax reform and chance to have a fresh look how do make America market place more competitive. A lot people people during the Campaign focus negative parts of the messages from the both candidates. Once we got through the election, many people began focusing on positive messages. That’s how market business responded. There seems to be in meaningful shock at corporate tax reform and regulatory reform. In addition," Markets go up and Markets down.Thats what healthy markets do.President speaks and people will listen and of course markets will react.Words matter.I think its time to do a holistic review about the market structure in the USA." said Mr Tuttle. Brexit is an opportunity or not? "We operate energy exchange from London office. How the future business will be regulated. One of things investors or companies want picking the location or raise capital is some certainty of regulatory environment and tax regime over next 4 yrs . US has some uncertainty and other part of the world have more certainty" Tuttle added. Turkcell is the first company from Turkey to be listed on the NYSE. It has a current valuation of more than 10 billion USD and is among the 500 largest NYSE-listed companies, in terms of market capitalization. Turkcell (NYSE:TKC)(BIST:TCELL) marked its 15th year as a publicly-traded company as it rang the Closing Bell® on the New York Stock Exchange (NYSE) two years ago. Turkcell Officials made a statement during their visit to NYSE. “The NYSE listing has made it possible for Turkcell to access the world’s largest capital market. Our listing on the NYSE also helped initiate a new era for Turkish business community as we demonstrated that a Turkish company could provide attractive investment opportunities for international investors,” Today, the company offers its institutional investors the investment flexibility to choose between the NYSE and Borsa Istanbul.